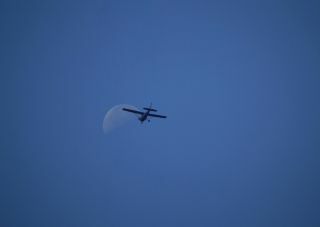 A propeller plane soars toward the moon over Reims, France in this image taken by VegaStar Carpentier on June 30, 2013. Carpentier used a Canon EOS 1000D to capture the photo. A propeller plane appears to have set an ambitious course for the moon in this stunning image. Avid night sky photographer VegaStar Carpentier snapped the photo from Reims, Champagne Ardenne, France on June 30, using a Canon EOS 1000D. A week before this photo was taken, skywatchers had enjoyed a full moon that occurred when the celestial body was at its closest point to Earth in its slightly elliptical orbit. This resulted in a so-called "supermoon," which appeared roughly 12 percent larger than normal full moons.